Deluxe double room. This spacious air-conditioned room with a flat-screen satellite TV, a safe, a desk, a minibar, an electric kettle and a coffee machine. The private bathroom provides a bath or a shower, a hairdryer, toiletries, bathrobes and slippers. Junior suite with balcony and lake view. This air-conditioned room with a balcony facing the Sea of Galilee. There is a seating area with a sofa and a flat-screen satellite TV. A safe, a desk, a minibar, an electric kettle and a coffee machine are available as well. The private bathroom is fitted with a bath or a shower and comes with a hairdryer, toiletries, bathrobes and slippers. The unique Europa Hotel welcomes you to step back into the early 20th Century and experience the crossroads of the Ottoman Empire, the British Mandate and the modern state of Israel. 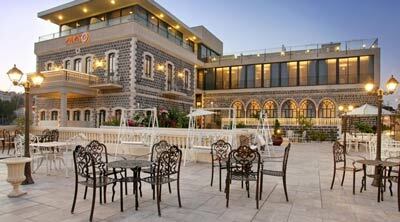 The hotel has been in this location in Tiberias since 1917. Heads of state were hosted here as it was relished for its style and beauty. The hotel has been refurbished and modernized for 21st century guests while retaining the authentic architectural elements and the charm of the original period. The imposing building with its basalt rock façade, high arched windows and geometric tiled floors is a feast for the eyes, without compromising the up-to-date comforts of modern luxury hotels. Tiberias can feel justifiably proud of the hotel, which is ideally located near the Sea of Galilee and a few minutes from the bustling town center. Europa1917 is a kosher boutique spa resort serving breakfast and dinner under the hashgacha of the Rabbanut Tiberias. Reserve your vacation through eLuna.com and be eligible for special benefits only through our community. Your credit card will not be charged till you arrive at the resort. There is no cancellation charge up to 4 working days before your visit. Step into the lobby and you will immediately be taken back to the Ottoman period when master craftsmen created beautiful ornate furnishings. The strong sense of history is apparent in the pictures and photos from the hotel's past throughout the hotel, along with historical newspaper clippings collected from the beginning of the twentieth century. Stretch your legs and take a stroll in the hotel’s orchards and enjoy the rich aromas of its fruit trees and herb plants. Relax on the spacious terraces, with stylized wrought iron tables and chairs. Enjoy some of the dozens of health and beauty massages and spa treatments available. The resort recommends that you book your treatments about a week in advance of your visit. There is also a dry sauna, fitness equipment and a heated pool. Our visit to the Europa Hotel. A Personal Account. November 2016. We spent Shabbat at the Europa Hotel with another adult couple. This was a great success and I will tell you why. First, Europa is a kosher hotel where we felt comfortable observing shabbat. The hotel is small enough to get to most rooms without the elevator. The dining room is steps away and there is a shul on the ground floor with a guaranteed minyan every shabbat. The food was some of the best that we have ever had at any hotel on shabbat. Meals were buffet with a large selection. The pastry chef offers unique cakes, dairy and parve. The hours specified for the meals are somewhat flexible, enabling us to enjoy the breakfast after the morning davening, and the lunch several hours later. I cannot remember a more relaxing and enjoyable Shabbat away from home. Europa is a hotel/museum of early 20th Century Tveria. Photos of Tveria and of the hotel at various periods, decorate the walls and the elevator. Much like a museum there are plaques that explain the history of the town. 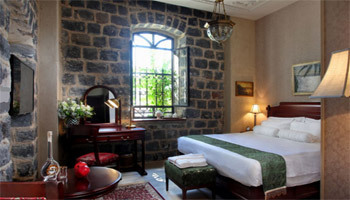 The hotel is tastefully decorated in period yet modern style. The floor tiles, fixtures, furnishings, all create the ambiance of another age. Europa has just 30 rooms of varying sizes. We were in a Baron room with a lovely small porch. There are many larger rooms and rooms with larger porches. There are also garden rooms on the lower floor, family rooms, adjoining rooms and suites. The fitness room is adequate for the number of rooms but the pool is too small for swimming. The hotel hosts a mix of guests, from hassidim to non-jewish tour groups. There is no check in on shabbat, retaining the atmosphere that makes this such an ideal location for Shabbat observance. The hotel is located on a hill above the boardwalk. 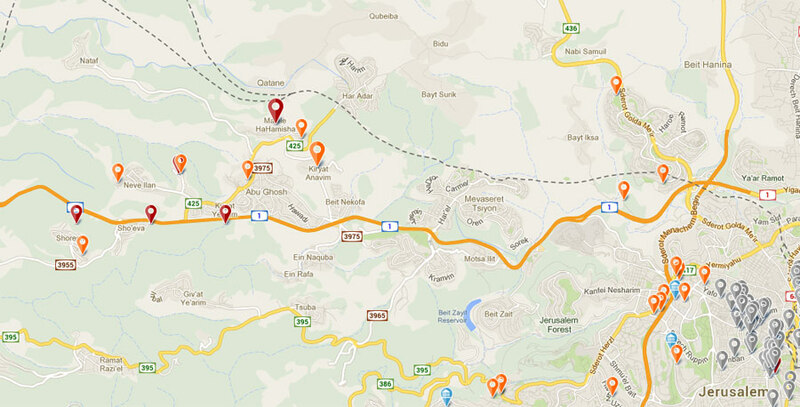 It is a 3-4 block walk to the kinneret. Free parking in a lot across the street from the hotel. Dining: Your reservation includes a generous buffet meat dinner with a variety of salads and hot main dishes, and a dairy breakfast with both cold salads and hot dishes the following morning. Meals are served in the hotel's Victoria restaurant with Chef Uri Arnon. One of the top chef's in the Galilee, Uri is the owner and chef at the famous Arnold's restaurants in Netiv Hashayara (near Nahariya) and in Ramat Yishai. Born to an Iraqi mother and a Swiss father, Uri specializes in Balkan and Turkish dishes with a European twist. You will find traditional stews such as sofrito and ossobuco alongside fresh fish prepared with imagination and precision, as well as uncommonly good fresh salads reflecting the changing seasons. 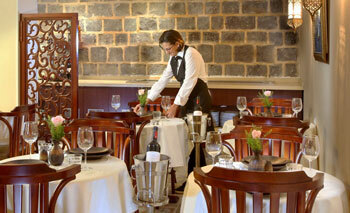 The hotel boasts its own wine cellar with hundreds of bottles of excellent wines. Kashrut: Europa1917 hotel is under the hashgacha of Rabbanut Tiberias. There is an on-site mashgiach weekdays and a mashgiach on Shabbat. Food products have the Rabbanut hashgacha. Leafy vegetables are Gush Katif. Only mehdarin products at the breakfast. Mehadrin meat available upon request in advance. See the mashgiach kashrut for details. Ask for Rabbi Yosef Zeev. luxuriously outfitted period rooms outdoor heated pool fitness room Treatment rooms for single and couple treatments Dry sauna Designated Synagogue room Wine cellar In-room mini frig and coffee/tea corner. Rooms: While preserving its original grandeur, the hotel has been renovated with modern amenities including LCD television, Wi-Fi, mini-bars and a variety of other treats and surprises. All rooms are doubles, for two people sharing. A limited number of rooms have a fold out sofa that can be used for up to one child. * The charming Knight room is the elegant double room without a porch. * The Baron room, a double room with a porch. * There is one suite at the hotel. We recommend you visit the Fort Balcony, a sun roof offering spectacular views, including an 18th century fortress; and for those wishing to relax, ‘shanti corners’ with bean bags, comfortable cushions and porch swings. 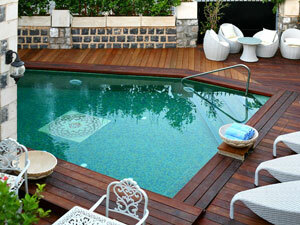 Spa and Outdoor Pool: the Hotel Europa offers a stylish spa with a full treatment menu including a dry sauna. Spa treatments take place in intimately designed, well-equipped rooms and are provided by professional therapists, using the finest oils and creams in an atmosphere that will embrace you with serene tranquility. location: Europa1917 is located in Tiberias. Free onsite parking. Conference Room: The Hotel has a sixty seat conference room available for lectures, seminars, and conventions; the room is fully equipped for all your multimedia needs. For culture enthusiasts: The Hotel Europa offers a rich entertainment program including guided tours, folklore nights, music, dancing and much more. Book your reservation through eLuna.com and enjoy these benefits. * Stay two nights mid week and enjoy two free 30-minute treatments. * Free room upgrade if rooms are available. * Add NIS 100 to the Baron rate for a room with private hot tub on the porch. Rates quoted are per room. Rooms accommodate up to two adult guests. * Rates are for half board including dinner the evening of your arrival and breakfast the following morning. * Shekel rates apply to Israelis and include VAT. * Dollar rates apply to tourists presenting a foreign passport with a tourist entry stamp. * Discount rates do not apply during holiday periods. Infant up to 2yrs old and a child is 2 - 12 yrs. Save 5% on the room rate (not including chagim and specials) and 20% on all treatments when you reserve through eLuna.com. Mid-week specials apply only Sunday - Thursday night, based on availability, not including holidays. Note: Contact us for additional discounts if you are a partly of 3 rooms or more. When we receive your form we will process your reservation. If you are making an inquiry please state this in the comments section of the reservation form and we will not process the reservation. All price information is on this page. Save time and check this page before sending an inquiry. We do not answer questions about availability. Availability changes from minute to minute. If the dates and room requested is available and you have entered all the information in the reservation form, we will get it for you. Otherwise we are sorry, we cannot help you. The hotel reserves the right to discontinue this offer at its discretion.